BROOKLYN, November 17, updated with video -- A raucous march over the Brooklyn Bridge on Thursday marked the two month anniversay of Occupy Wall Street, and two days since the eviction of its Zuccotti Park encampment. Regrouped in a park in downtown Brooklyn, the mood was not diminished; a winter of protest in the snow was promised. Thursday evening's march was filled out with union workers, from SEIU, 1199, Verizon and others. The police diverted the front of the march from Foley Square the long way around City Hall Park, where electric candles were passed out. At the entrance of the Brooklyn Bridge a blinking sign read, Ped[estrians] on the roadway are subject to arrest," a reference to the mass arrests of October 1. The march took hours to cross from Manhattan to Brooklyn. Inner City Press marched behind a brass band of tubas and trombones, the crowd appreciative, stopping the applaud when slogan of the 99% were projected on Verizon's walls. 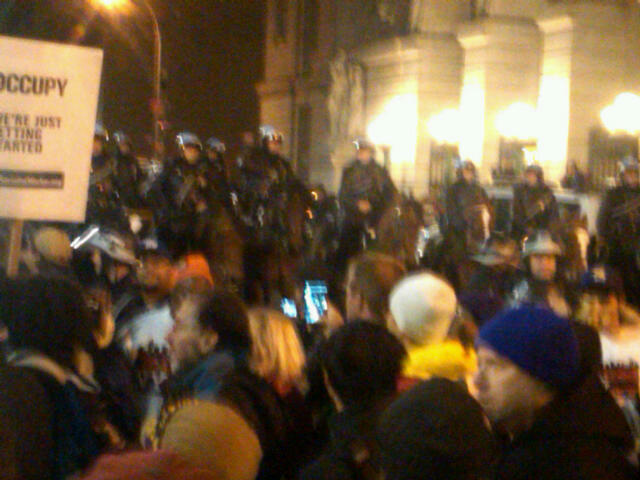 Once in Brooklyn the riot equipped police were surprised by the mood. A General Assembly was convened in Veterans' Park, with report-backs from Occupy The Bronx and the destroyed then reconstituted library. The crowd was so large that three separate mic checks started up. Earlier on Thursday the target was more focused: the New York Stock Exchange. Thursday evening was about movement building. On the bridge a gray haired man chanted, "What do the Sixties look like? This is what the Sixties look like!" In the park in Brooklyn one of the mic-checkers said, This is not just about money, we have to show we care about each other. That was the mood, far too rare. With or without Zuccotti, the movement is needed and seems to have legs. Watch this site.